Duluth News Tribune: Kids have always been told to ignore bullies by their parents and teachers, he said later. But it’s dangerous, he said, because once something is said, it has entered your brain. “It breeds depression, it breeds drug use, it breeds alcoholism and anxiety, it breeds self-harming, and it breeds suicide,” he said. In one bit, he took a few bites out of an apple and licked it before throwing it to a student. She didn’t catch it, letting it drop to the ground. “Why didn’t you catch that?” he asked. “Germs,” several students said. That’s what the Scary Guy wanted to hear, after spending several minutes talking about how food and words are both forms of energy absorbed by the body. “Just as you are responsible to use food to keep you alive, you are responsible for the words you use,” he said. “If you accept the rotten words into your mouth, you can get sick.” The work of the Scary Guy is going to change school culture in Proctor and Hermantown, said Molly Johnson, community education director for both districts (The Scary Guy uses humor and interaction to talk about bullying). 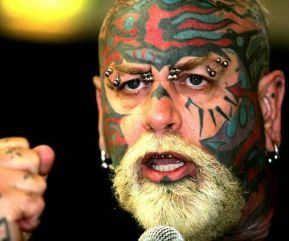 The Scary Guy (born December 29, 1953) is a United States based motivational speaker who campaigns worldwide to eliminate hate, violence, prejudice and bullying in schools and corporations. In addition to being a tattoo shop owner, philosopher, comic, entertainer, inspirational speaker and performance artist, his nose, eyebrows and ears are pierced and tattoos cover 85 percent of his body. The Scary Guy legally changed his name from Earl Kenneth Kaufmann in 1998 to The Scary Guy and now focuses on teaching children and adults love and acceptance of all people. His mission is to eliminate hate, violence and prejudice worldwide. His audiences consist of both youth and adults, within schools and corporations worldwide. His philosophy is that "if someone calls you a 'rotten word' it's their problem not yours. And you choose to accept what they say" (Wikipedia).